DigNittany: It’s the last day of 2017. At the start of the season, it certainly wasn’t a given that the team would make the Final Four, and certainly wasn’t a given that Coach Rose would go to a 6-2 offense. But they did (and came within one “can’t-believe-that-just-happened” broken play from making the Finals) and he did. What’s your 2017 wrap on how the team performed? Talking Head: From a coaching standpoint, the team didn’t achieve its goal — which was to win it all. But from an overall perspective, the 2017 season absolutely was a success, and one that was interesting — very interesting. Running the 6-2, which allowed Coach Rose to utilize both 6-0 Sr. RS/setter Abby Detering and 6-0 RS Jr. setter Bryanna Weiskircher — both terrific servers. The development of 6-2 Sr. RS/Opp Heidi Thelen (who earned AVCA Honorable Mention), and her transition from MB to rightside (she ended up hitting .360 overall for the season, and .350 for conference-only — both of which placed her 7th in the B1G) — that was certainly a success story. I think the emergence of 6-2 MB Tori Gorrell into a player who competed at a consistently high level (she hit .453 for the season and averaged 1.02 blocks/set) was a real positive. And you have to give a shout-out to 5-5 So. libero Kendall White, who elevated her game from an already high level, to where she was named 2nd Team AVCA All-American, averaging 3.76 digs/set. (For perspective, White is the first Penn State libero to earn All-America status since 2005, when Kaleena Walters was named to the Honorable Mention team, and only one other libero — Stanford’s So. Morgan Hentz, who was named to the 1st Team — earned AVCA All American honors in 2017.) It seemed that the more physical the match was (think Michigan State) the better Kendall White played. She certainly was a big part of the team’s success. 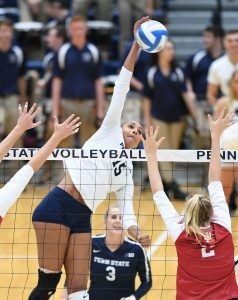 DigNittany: What are your thoughts about the senior seasons of 1st Team AVCA All American 6-3 Sr. MB Haleigh Washington, 1st Team AVCA All American 6-1 Sr. OH Simone Lee and Honorable Mention AVCA All American 6-1 Sr. OH Ali Frantti? Talking Head: Haleigh Washington consistently seemed to be playing at some sort of interplanetary level. And then you see the growth and maturation of a player like Simone Lee — Coach Rose has said he’s never had a player improve year-after-year as much as Simone Lee — to the point that she would have been my pick for National Player of the Year (and I mean no disrespect to Stanford’s 6-6 Kathryn Plummer, who is a terrific player in her own right). Overall? 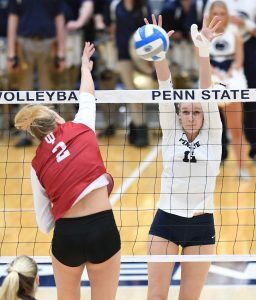 We’ve talked frequently about the contributions Ali Frantti made to the team this season — a true six-rotation player who many matches was Penn State’s best passer, and who also contributed key kills, blocks and digs in so many wins. A real competitor who will be missed a lot. About the last match, it was the little things that got us in the end. But I thought Penn State and Nebraska were the two best teams in the country, so there’s no shame in losing to #1. It’s hard to set aside that season-ending loss, but this team enjoyed great success: 33-2 is an amazing season and the players and coaches deserve tremendous credit for that accomplishment. The team played great on the road, and won a lot of very tough matches against very good teams. Every Penn State player and fan should be proud of this team and what it accomplished. DigNittany: Totally agree. 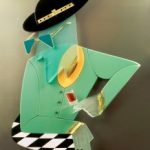 So what’s in store for 2018? The seven incoming freshmen are highly-touted, and with eight departing seniors, it looks like they’ll need to be ready to play from the get-go. Talking Head: As I’ve said before, I think we’ll probably see a traditional 5-1 next season — something similar to years when we didn’t have two six-rotation players, with DS substitutions for a couple of the pin hitters. I think Jenna Hampton will be playing right from the start, subbing in for one of the outsides and playing the back row. 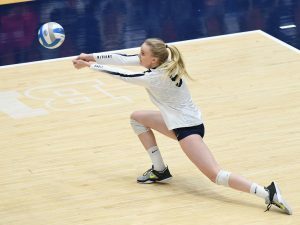 I’m not saying she’ll beat out Kendall White for the libero spot, but from what I know, she is very, very good (in my opinion, the best libero in the 2018 class, even though PrepVolleyball.com had a couple of other liberos ranked ahead of her) and I think she will regularly play three rotations. And look, don’t count out Brooklynn Hill. I don’t know as much about her, but she averaged something like 4.5 digs/set as a senior, so she’s got skills too. 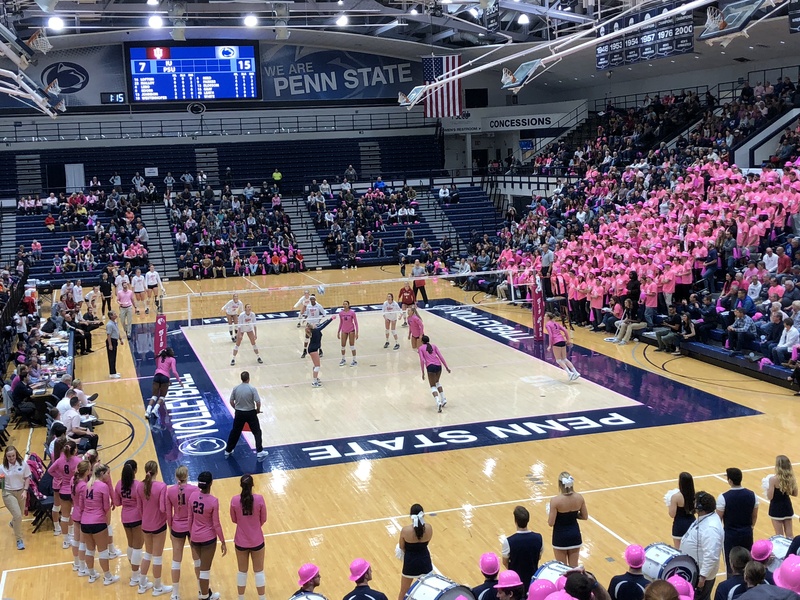 DigNittany: Many Penn State fans are concerned that the 2018 class has three middle blockers (6-5 Kaitlyn Hord, 6-2 Serena Gray, and 6-4 Amanda Phegley), with one RS/setter (6-1 Jonni Parker), and no one identified as an OH. Although there’s a lot of speculation about an OH transferring in, let’s just look at the players we know will be on the roster in 2018. Where do you see these incoming freshmen playing in 2018? 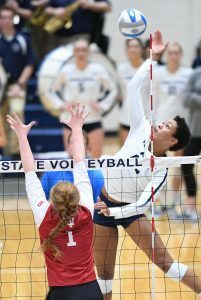 Talking Head: I think a kid like Jonni Parker is a good enough athlete that she can be a six rotation player, and will very likely be in the starting lineup at one of the pins. Although she’s a RS/setter, I think she can probably also play on the left — she seems to be that good of an athlete. Then it may be up to a player like Amanda Phegley to be a three-rotation pin player. Serena Gray will definitely be in the mix in the middle, as will Kaitlyn Hord, Tori Gorrell and Cami May. DigNittany: So who’s going to replace Salima? Talking Head: I really don’t have any inside information on that, but I wouldn’t be surprised if it was a former player. Given that Coach Rose has been at Penn State for nearly 40 years, that’s a pretty big group to draw from. But we’ll see. DigNittany: Thanks, as always for your time. We’ll speak next year. Blue and white fireworks in Cape Town, by Azwi. This file is licensed under the Creative Commons Attribution-Share Alike 3.0 Unported license.